Got an iPhone? Well, now you won't have to wait too long for my site to load. As of today I made a very simplistic but somewhat useful mobile section to the site. 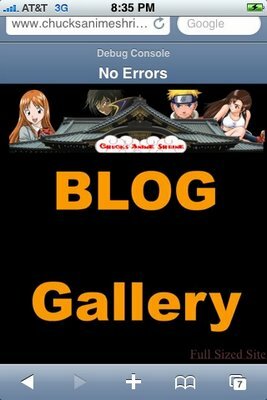 as of this post, if you go to the main part of my site, chucksanimeshrine.com and you have an iPhone, you will be redirected to the Mobile page. From there you can view that anime, figure, idol photo galleries and the mobile version of this blog as well. If you don't have an iPhone, you can still bookmark that page. The links should still act accordingly for your phone since the blog link goes to the rss feed and the gallery link goes to the MoblieMe gallery page directly , thus if your phone can convert an RSS page and if the MobileMe site can detect your phone...it should work ok.
Also, as you can see below, a few week ago or so I added an iPhone web icon for the site so this site can almost act and look like an iPhone app.